FK Lowry Piling have completed a secant bored pile wall in London. Over 400 No. 600mm dia. 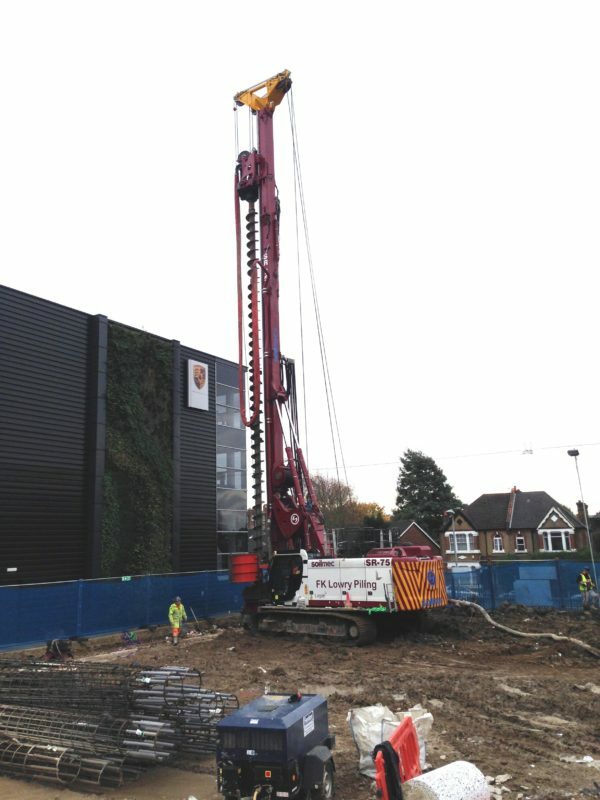 CFA Piles were installed on the project in Chiswick, West London to form 180 linear metres of secant wall for a 6m deep basement for a new Safestore, Self-Storage Facility. The high profile scheme was located adjacent to the busy A4 Dual Carriageway, the main Western thoroughfare into and out of London. The Ground Conditions consisted of Made Ground & Fill overlying water bearing loose to medium dense Sands & Gravels before very stiff Clays were encountered at depth. FK Lowry’s Soilmec SR-75 piling rig is a dual discipline Rig and has a maximum CFA depth capability of 29m.